"Crucifixion to the World, by the Cross of Christ. Gal. vi. 14. 1. “When I survey the wond'rous Croƒs On which the Prince of Glory dy'd, My richest gain I count but Loƒs, And pour Contempt on all my Pride. 2. ”Forbid it, Lord, that I ƒhould boaƒt Save in the Death of Christ my God; All the vain Things that charm me moƒt, I ƒacrifice them to his Blood, 3. "See from his Head, his Hands, his Feet, Sorrow and Love flow mingled down! Did e'er ƒuch Love and Sorrow meet, Or Thorns compose ƒo rich a Crown! 4. "[His dying Crimƒon, like a Robe, Spreads o'er his Body on the Tree; Then am I dead to all the Globe, And all the Globe is dead to me.] 5. "Were the whole Realm of Nature mine, That were a Preƒent far too ƒmall; Love ƒo amazing, ƒo divine, Demands my Soul, my Life, my All." “There is just enough of Watts left here to remind one of Horace's saying, that you may know the remains of a poet even, when he is torn to pieces." 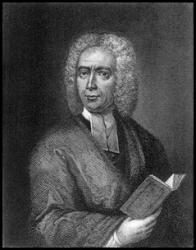 While Watts might not have been talking explicitly about money in the last line of his text, there is the expectation that we dedicate ourselves entirely to God, for God demands not just a piece of who we are, but “our soul, our life, our all.” This can be an incredibly difficult line to sing with any sense of honesty. Devotional author Jerry Jenkins writes in his book Hymns for Personal Devotions, “Perhaps it’s the distance between where Watts encourages me to be and where I truly am that makes this hymn so hard to sing. It’s a lofty and worthy spiritual goal to say that ‘Love so amazing, so divine, demands my soul, my life, my all,’ but how short I fall!” (Jenkins, 44). And so as we sing this hymn of love and awe, we must sing it with a prayer in our hearts, asking God to enable us each day to live our life wholly for him. Greg Scheer speculates that perhaps Watts eliminated this verse to focus our attention on our own response to Christ’s crucifixion rather than the actual event itself. This would make sense since Watts wrote the text for a collection of hymns for the Lord’s Supper, an act in which we remember and respond with gratitude to Christ’s sacrifice for us. 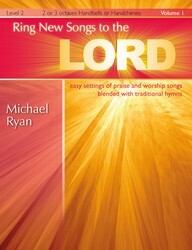 Apart from this verse being omitted, not much else has changed in this text, and for good reason: the Psalter Hymnal Handbook writes that “Watts’ profound and awe-inspiring words provide an excellent example of how a hymn text by a fine writer can pack a great amount of systematic theology into a few memorable lines.” The only slight differences you can find between texts are changes of a few words, such as “present/tribute/offering” in the fourth verse. The first tune used to accompany Wesley’s text was HAMBURG, composed by Lowell Mason in 1824, and based on a chant in the first Gregorian tone. The whole melody only consists of five notes. Some argue that this allows us to focus entirely on the text. Others, like hymnologist Erik Routley, wrote that “the attempt to square up Gregorian chant into a regular 4/2 rhythm and to harmonize it with straight chords was fatal to the enterprise…as a hymn tune it has no merit whatever and claims none” (Westermeyer, Let the People Sing, 299). Westermeyer adds that while this tune might be “dull to the analyst,” it is often much appreciated and loved by the congregation. HAMBURG is the most commonly used tune, however, and there are a number of good arrangements of the tune. 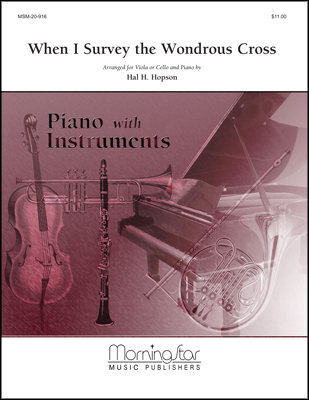 A well-known medley was arranged by Chris Tomlin and combines Watts’ text with a refrain, “O the wonderful cross, o the wonderful cross, bids me come and die and find that I may truly live.” When using this medley, build into those refrains instrumentally and pull back on each of the verses. Originally written for The Lord’s Supper, this hymn can be used at this point in a service throughout the year. 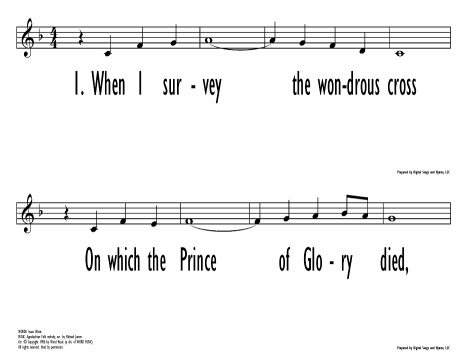 Our remembrance of Christ’s death and resurrection through Watts’ text also makes this a much-loved and often-used hymn for Lent, especially Holy Week. On Good Friday, consider singing it at the very end of a Tenebrae or Good Friday service as a reflection on the rest of the service and the events of Holy Week.